Today we are going to talk about basic yet important makeup tips that will improve your filmmaking projects. Welcome to Pull My Focus, adventures in the world of digital filmmaking where we give you the tips, tricks, and techniques you need to make great video. Today way have an awesome guest, Jocelyn Barrios, to talk about on set makeup. For a lot of filmmakers, I’m going to bet due to limited resources, you probably ask your female actors to handle their own makeup, and for the men, well, they’re fine. Men don’t wear makeup anyway. But on video, would it help if men had some makeup? Does the everyday makeup an actress puts on work for film? You know that makeup, along with wardrobe and hair, help design and convey the look and feel of a character. It’s a creative part of the craft. But you can’t always get a makeup artist, especially if your shoot is just of one person for a couple of hours. So we’re going to show you some basic makeup tips that you or someone on your team can use. Ask your talent if they have any allergies to makeup they’ve used in past. You don’t want your shoot ruined by a bad skin reaction. The makeup station needs to be lit with the same light you’re shooting in. Natural if shooting daylight, tungsten if shooting tungsten. Let's clean the face first. Working with a clean canvas is important to clear the face of any oils and dirt that you may have. Powder on men is a minimal makeup application that helps prevent shine. I suggest a translucent powder so that you’re not affecting the actor's skin color. If you need to do that, we’ll have to cover that in another video. 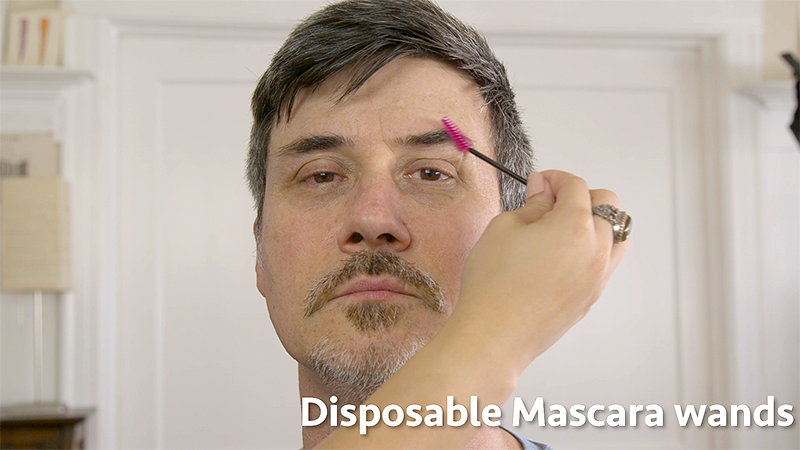 Use Disposable Mascara wands to groom the eyebrows and mustache. They’re great for grooming beards and eyebrows as well as applying mascara. You want disposable for hygiene reasons. If you use the same wand that comes with the mascara on several people, you could give them pink eye. 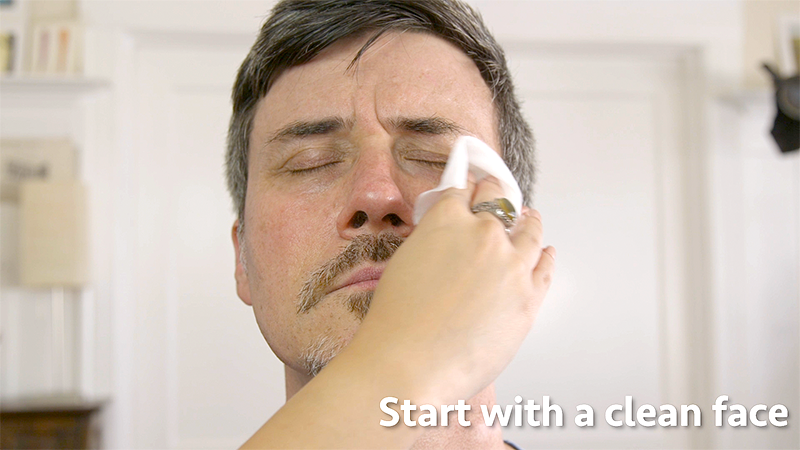 Clean the face first, just like we did before, with the makeup remover wipes. Apply primer which works as a base, helps our makeup last longer and helps us better see the difference in makeup that we apply. I use Derma Shield which also works as a barrier from damaging the skin, especially when I work with special effects makeup. Once you’ve applied the primer, it’s time for some concealer to hide any dark circles under the eyes. In a closeup on video, you’re more apt to notice differences in color and contrast than you would in person. We’re drawn to look at a person's eyes and dark circles are not pretty. Once you’ve blended that out it is time for foundation. Make sure you have a matte foundation that fits the skin color of the person. Tell the actress to bring her foundation and if it’s not matte, get a matte version for her. You don’t want to have to get into buying the right foundation. There are so many choices. Some skin has pink undertones, yellow undertones, etc. After that, you want to set it with the translucent powder which locks in our work, magnifies it, and also prevents any shine or oil from appearing on camera. Now if you want eye shadow, you’re better off with matte shades for a more natural look because anything with shimmer will pick up light easily and gives a glam makeup look. Unless that’s the look you are going for. Last but not least, an Eyebrow pencil, to define the eyebrows. And mascara to help define and fill out the eyelashes. I would skip eyeliner. It’s not considered a natural look and you’re getting into more complicated territory where a more experienced makeup arts would be needed. You can get affordable packets of them on Amazon, see links in the description. Buying multiple helps with keeping proper hygiene as well. You do not want to use the same brush on more than one actor unless it’s been cleaned after every use. And there you go. 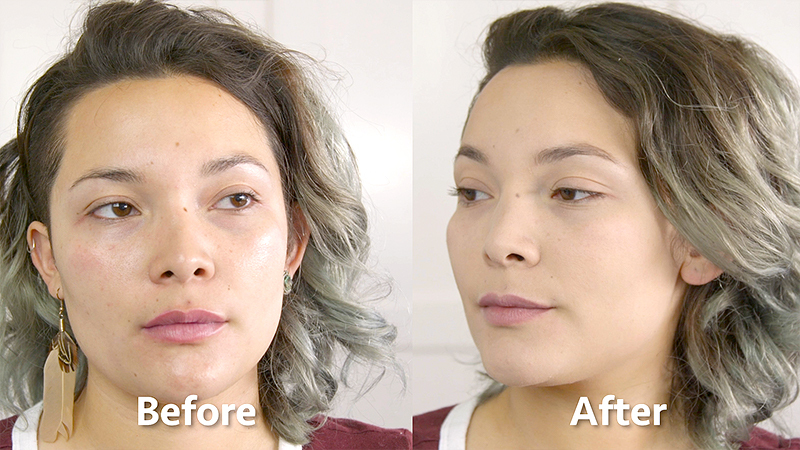 Basic makeup that can help elevate the look and feel of your videos. Recommend doing some tests if you can and see what works best for your talent and shot. Thanks for watching and to our guest Jocelyn. Check out our other videos on production and post production video techniques.